At first sight, a quite strange cooperation which came together. A mathematic professor, specialised in the probability theory - in latin are conjectandi, the Art of Suspecting - meets a dancer and choreographer. Both will work on picturing the Theory of the Austrian physician and philosopher Ludwig Eduard Boltzmann (1844–1906) into stage sceneries. That could sound like the plot of a roman from Umberto Ecco. 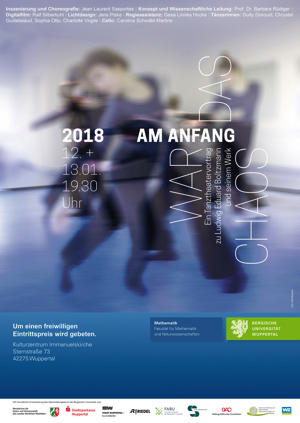 But Barbara Ruediger Mastandrea and Jean Laurent Sasportes made this reality and presented the « Dance-theatre Lecture Demonstration » titled « At the Beginning was the Chaos » on 12th. And 13th. January 2018 in the Immanuelskirche, Wuppertal (Germany). I had a real interest in mathematics and physics, but somehow, I was missing the possibility to understand it through pictures and images. So I found quite a strong coincidence that, forty years later, after that my life and decisions brought me into a total different world then science, someone comes to me and propose me to explain the work of a famous mathematician into dancing choreography and dance-theatre sceneries!. My interest for science was still strong, and I accepted the challenge of course with no idea of how I could assume it artistically. At first Barbara introduced me to Boltzmann`s work. This introduction process will be repeated later for all the dancers and for our video artist Ralf Silberkuhl. For this purpose, Barbara used the great didactical work that she had done in the past. This presentation work was inspired by Carlo Cercignani`s book, "Ludwig Boltzmann -The men who trusted atoms" . Barbara made it to illustrate a seminar about Boltzmann dedicated to a non scientific public. She presented this seminar at several occasion. 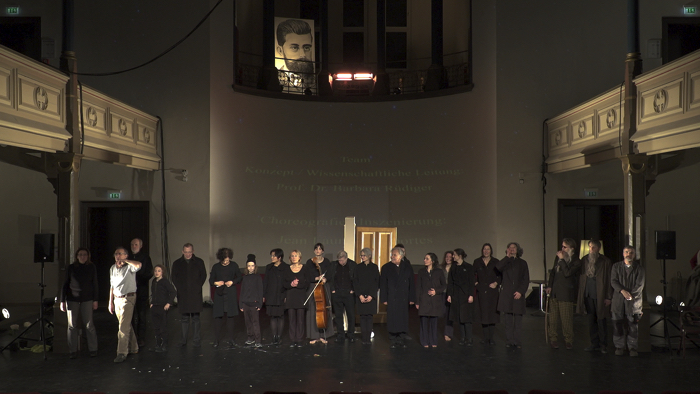 The intention of this project was to manage to present a dance evening which could, on one way present the work of Boltzmann in an understandable way for a non scientific public, but at the same time, present a dance-theatre performance which could be enjoyed just as a piece of art. The reaction of the public during the public meeting which followed the performances evenings, showed that in a way we did succeed our goal. Dance public did enjoyed the dance and play that they saw, but also had the feeling that they understood what was Boltzmann working at (some of them declared that they will never understand anything to maths, but that they liked the dance very much). And, teachers and scientific public, who had no experience in watching dance performances, liked what they saw and judged the pedagogical intention positively. Now, I am very happy that I did accept this project and, Barbara and I, have the intention to develop this form of performance with others mathematical field.